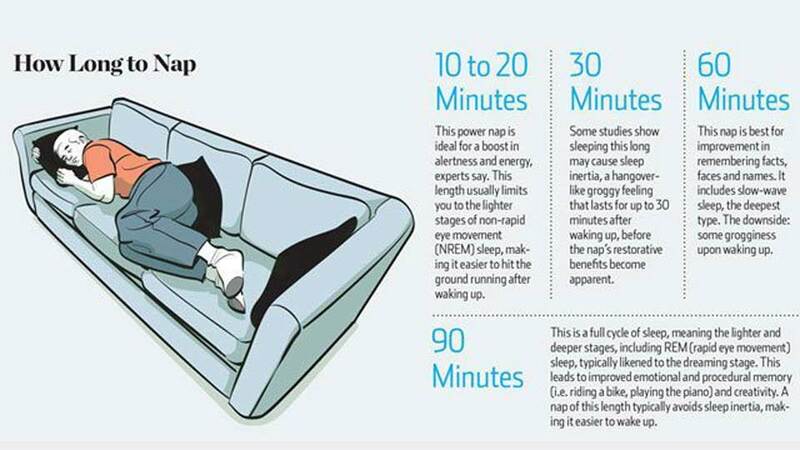 So what are the most ideal ways to nap? Napping can be seen as a quick reboot or boost for the brain. Think of when your computer is starting to perform slowly and things aren’t responding up to par, after you shut everything down and do a reboot, things are back up to speed. The brain is quite similar in that, as you nap, even for very short periods of time, benefits can be seen in a number of areas. Sleep experts suggest that taking a 10-to-20-minute power nap can give you a quick burst of alterness and mental clarity when you don’t have much time. This can be used throughout the day, late at night, before something important or right before you are trying to beat the final boss of a video game you’ve been playing all night right and you know you need the extra quickness. When I was interested in trying to maximize my time awake (which I still am, but haven’t tried much lately) I did some research into sleeping cycles and how to minimize the amount of sleep you need while still being able to function well. I ended up choosing a cycle that gave me a core sleep and then several naps throughout the day that lasted about 20 minutes. I found that after the 20 minutes naps, I felt great. Very alert, mental clarity was high and I was ready to go for the next 3 or 4 hours easily. I found though, that near the beginning of my experiment with cycles, I would start to lose cognitive clarity as I got closer to the end of the day. While this was part of the transition portion of the cycle, I got to feel what its like when the brain just isn’t getting enough deep sleep. According to Dr. Mednick, this is where longer naps of 60 minutes or so are said to be good for increasing that cognitive power again. Mednick also states that the 90-minute nap will likely involve a full cycle of sleep, which aids creativity, emotional and procedural memory, such as learning how to ride a bike. Waking up after REM sleep usually means a minimal amount of sleep inertia. A study evaluating the recuperative effects of short and ultra short naps found that napping for 5-10 minutes can create a heightened sense of alertness and increased cognitive ability when comparing to not taking a nap at all. If you are looking for a quick recharge: nap for 5 – 20 minutes. If you are looking for deeper sleep rejuvenation: nap for 60 – 90 minutes. Final tip: When you take your shorter naps, sit up slightly as it will allow you to avoid falling into a deeper sleep. If you dream during these power naps, it could be a sign that you are sleep deprived. ‘The Man With the Golden Voice’: Where Is Ted Williams Now? Uplifting, inspirational, feel good news stories from around the globe. This is an escape from the controversial, fear-mongering, depressing news that is riddled with sensationalism. There are still good, honest, compassionate people in this world and this is a place to publicize that. Copyright © 2019 Good News Center. All rights reserved.